The client is the Health Sciences academic center at Emory University. Their organizational components includes Emory University School of Medicine, Nell Hodgson Woodruff School of Nursing, Rollins School of Public Health, Yerkes National Primate Research Center, and Emory Healthcare, the WHSC&apos;s system of clinical facilities. The WHSC&apos;s namesake, Robert W. Woodruff, the legendary leader of The Coca-Cola Company, was a man whose vision and generosity left a lasting imprint on Emory and on Atlanta. The project mission was to tell the big picture story of WHSC and to provide a front-end portal to its component organizations. The client&apos;s legacy site was originally developed in the late 90&apos;s. The organization had grown and web technology expanded greatly since its creation. WHSC&apos;s site was in need of not only a graphic redesign, but also a complete reorganization of content and upgraded navigation. News and publications is an important and visible aspect of the center&apos;s public service committment. The Office of Health Sciences Communications serves the external and internal communications needs of the Woodruff Health Sciences Center and its principal constituents, including Emory Healthcare. The presentation of these press releases demanded a more scalable solution than presently in place. A facility was needed to store, search, and display these articles sometimes numbering in the thousands per year. Currently no event management system or calendaring system was in place and the organization needed to publish events for the academic center. The XI Interactive team, members of WHSC&apos;s Office of Communications, and Emory&apos;s Executive Web Producer joined together as a team to accomplish the task. Much of the project timeline was spent in the reorganization and rewriting of content. XI worked in conjunction with Emory School of Medicine to develop and deploy a Press Release database and a calendaring solution on Emory servers utilizing a Cold Fusion application, XML, and Oracle databases - the technology standards in place by Emory I/T. The graphics were designed with a technical flair to show portray the WHSC as a technical leader in the health sciences. This web site really pushed the technology envelope for Emory at the time, and some were concerned at how it would be accepted. The launch was met with great success at all levels of Emory and at the Woodruff Health Sciences. XI Interactive met and exceeded the client&apos;s expectations resulting in additional web contracts with this client and with Emory University. The project was a great success. Change of Address - Reset Your Browsers! The Web site for the Woodruff Health Sciences Center has a new look, new content, and a new address. After spending close to nine years in its previous incarnation as www.emory.edu/WHSC, the Web site was re-launched Friday, February 27 at the new address of whsc.emory.edu. The new site is intended to be more visual appealing and to provide a clearer picture of the full scope of the Woodruff Health Sciences Center, says Ron Sauder, director of media relations, who worked with a team of staff members and consultants to complete the face-lift over the past year. "Both the graphics and the interactive technology of the web have grown more sophisticated since 1996 when the previous design was put in place," says Sauder. "Our new look makes much more extensive use of photographs, both people and places, so that a visitor to the Web site can tour the full spectrum of health sciences at Emory, from Grady and Crawford Long to each of the three Schools and the new Vaccine Center at Yerkes. We also have photos and bios for all of the officers of the Woodruff Health Sciences Center, helping to humanize an entity that is pretty abstract to many people." Like the old site, the new site functions as a portal, or front door, to the Web sites of the Schools of Medicine, Nursing, and Public Health, as well as Yerkes. 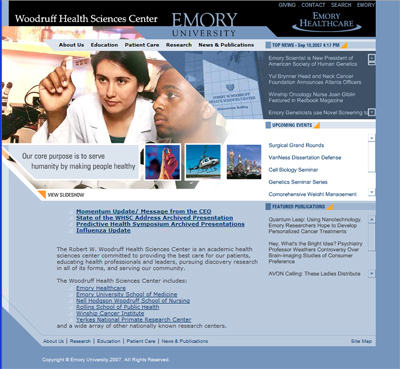 It also has multiple links to Emory Healthcare, but does not attempt to duplicate the patient information and clinical support functions of www.emoryhealthcare.org. The old WHSC site design made extensive use of pulldown menus, which meant that much of the deep content was literally not visible from the home page. The new site uses Flash rollover menus, pulling deep content up for ready comprehension. The site is divided into the main categories of "About" (which explains the history, leadership, and statistical profile of the Woodruff Health Sciences Center), Education, Patient Care, Research, and News & Publications. Blurbs on the home page highlight the most recent news releases, interesting articles from health sciences publications, and upcoming special events. All of the blurbs link to more information inside the web site. In addition to the "slide show" which provides a visual introduction to the WHSC for the first time, the site makes use of interactive technology with pre-loaded Yahoo and Mapquest maps (under About Us) and CNN.com, Google, and Yahoo search engines for an "Emory in the News" feature. Original WHSC pages -- apart from the deep archives of past news releases and publications -- have roughly tripled, from 50 to 150. The site was programmed and designed by Precision 1 Computer Technologies [now XI Interactive], headed by Steve Carlson, a veteran of the dot-com boom in Atlanta and longtime consultant to the School of Medicine. The RFP for the new site was written after a series of consultations with John Mills, executive Web producer for the University, and webmasters for the Schools of Medicine, Nursing, Public Health and Yerkes. Day-to-day implementation is being handled by Tracy Ovnic, webmaster for Health Sciences Communications. Database programming is being supported by the School of Medicine ITS Department. Many persons inside Health Sciences Communications contributed new editorial content, including director of publications Karon Schindler and director of science communications Holly Korschun. "We are grateful that Dr. Johns and Ronnie Jowers, CFO, saw the Web&apos;s potential and decided to invest in this upgrade," says Sauder. "In the 21st century, an organization&apos;s Web site truly is its worldwide calling card, 24/7/365. We are excited by the new look and plan to continue to develop new features that will make our Web a default destination for everyone internally and externally who is interested in the health sciences."